Laura does make it look easy, doesn't she? Her beautiful creations make me want to buy all the things! I think you absolutely nailed it, your card is gorgeous! Well, I love how you were inspired. Your card is gorgeous Joan! What a great tribute to Laura's style! To my admittedly inexperienced eye, the ink blending looks fantastic. 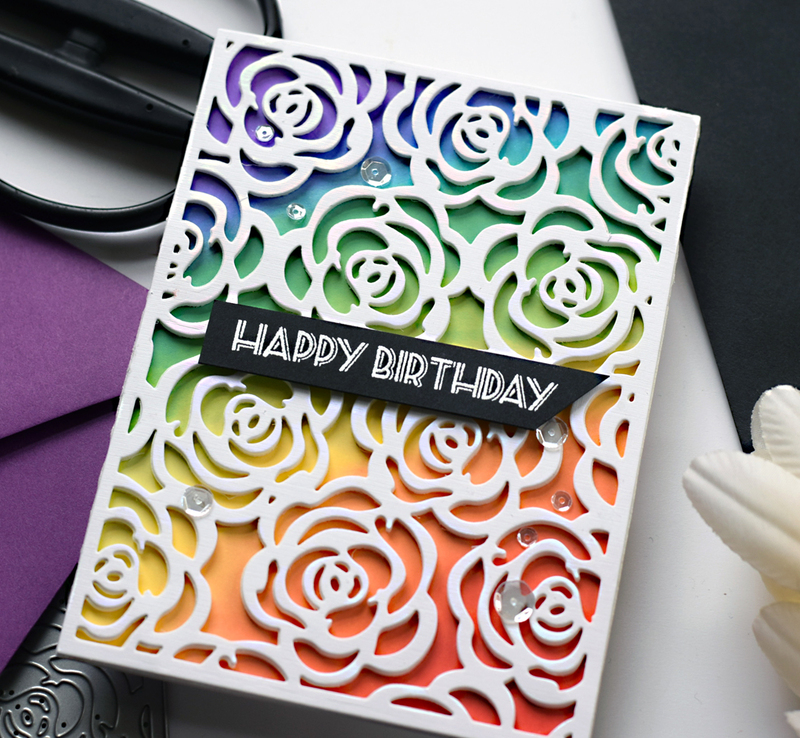 I really like the dimension you gave the flowers, too, and how the shadows add extra interest to the card. I'm excited to see what you come up with next! From what I've seen, Laura tends to use scripts or rounded letters with florals and curved shapes, and sans serifs or more pointy letters with geometric backgrounds and angular shapes. Here, the sentiment is angular and geometric, while the flowers are round and organic. This creates contrast, and maybe that's what you were going for, but would another type of font—say, one with curvy letters or rounded serifs—make the sentiment more cohesive with the rest of your card? So lovely Joan. Your card looks like a "Laura" card. I am thrilled that you chose to study her card making style. I always want to buy what she uses. Please, I want to know the tricks of her geometric style. Four medical appointments can eat up your crafting time. Good for you for participating in this clinical trail. Oh, Joan, your version of Laura's style turned out beautiful! I think I only have one cover plate as well (such an investment). Thank you for this inspiration series - I am loving it. And good luck with your appointments this week. I love this! And I also wish you and Laura were my next-door neighbors...Anyway, I wanted to tell you a trick that Laurie Willison taught me about fun foam. Keep it in the die/cover plate while you adhere the card stock. It prevents the foam from growing and shifting too much. Brilliant! I saw this card on Instagram today and I love it. 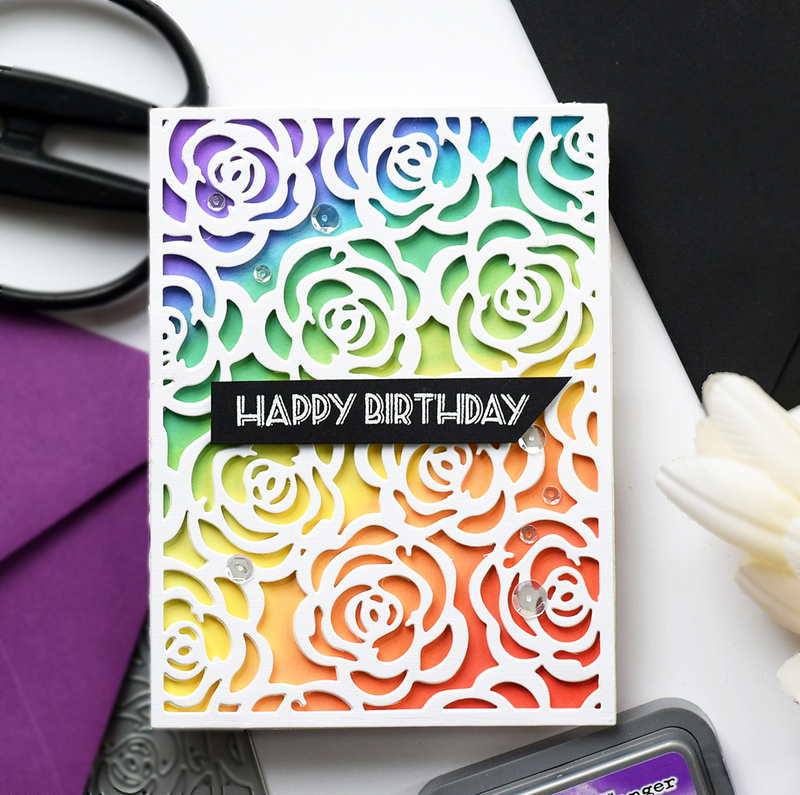 I can see Laura's rainbow influence and even in the close-up photos of your card it is hard to see any ink-blending flaws! Great job I think. Good luck with the all of the appointments this week. My mum had heart failure last year and they are trying to manage it with medicine but that does not appear to be working well. I hope your trial proves successful! You took to heart Laura's best and your card is fabulous. Check with crafty friends about the coverplates they have and ask them to cut you a few...you get to play with some new stuff but don't have to store it or pay for it. I remember your interview with Laura and it was the first time I'd seen her work, which I immediately fell in love with. You do have a way of finding the most inspiring stampers to follow. I agree that ink blending is not as easy as it looks, but if yours has flaws I don't see them. I see beautiful color and a lovely cover plate. Full size cover plates, grrrr. Expensive, may or may not cut perfectly every time, and I'm sure to have a hand twitch at the moment of adhesion. I do really like the idea of white on black sentiment panel. 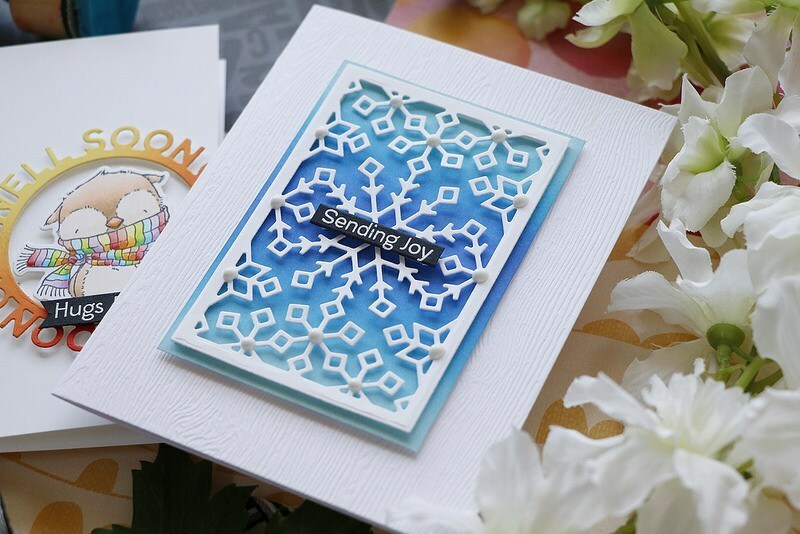 Requires embossing or a negative type stamp. All these cards today, including yours, put me in a swoon. I love color with lots of white to set it off. Good post, Joan! I Love your card, Joan, & am learning from YOUR posts! I adore Laurafadora too & her cards are pretty special. I like that you took the time to study them & now you are passing all the tips along to us. Thank you!! I LOVE your card! 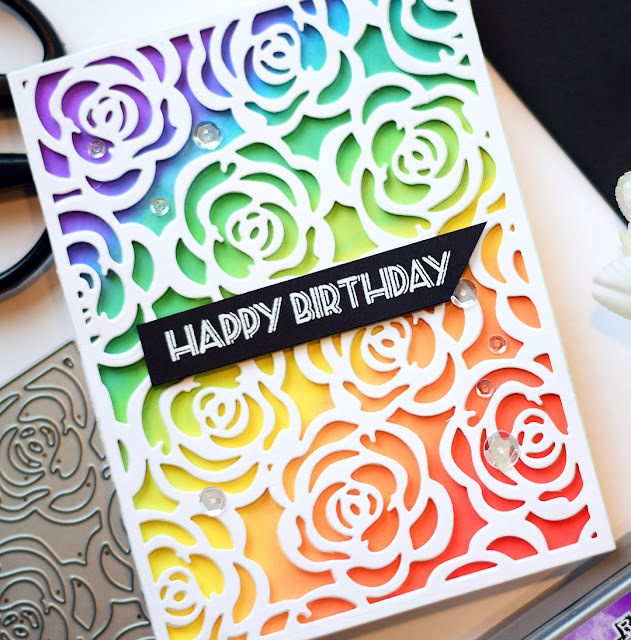 I love roses and coverplates and rainbow blending and Laura. Your card is a perfect ten. I like Laura Bassen also. She seems like a wonderful person to know and her card styles are always unique. Your card is really nice Joan. You did a great job! I am laughing. I also have discovered that cover plates hide a host of errors! 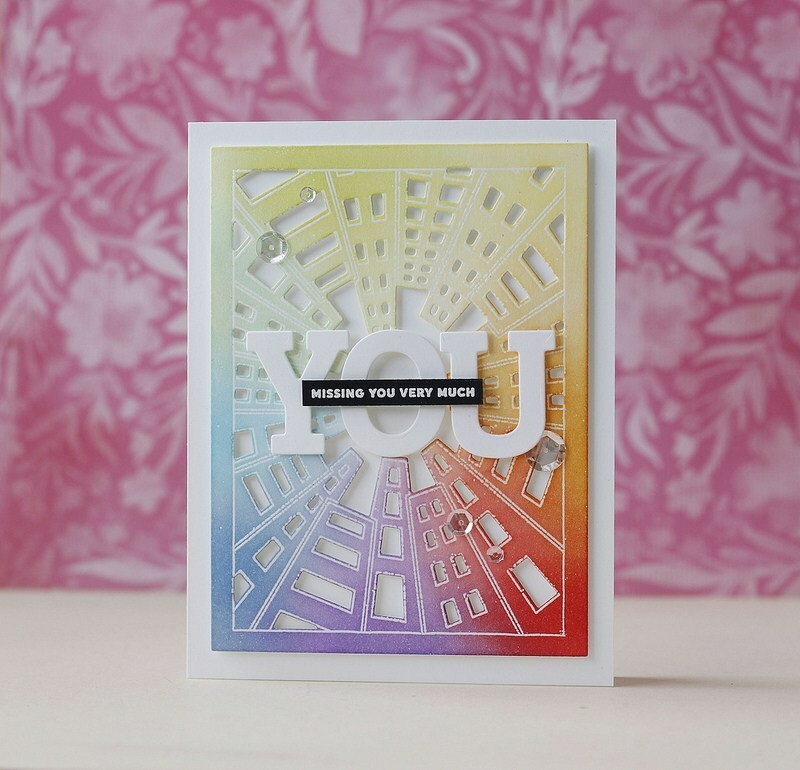 Your card turned out beautifully.